24/6 Maternity Nurse San Francisco and London. Due Date July 2019. Location of the job: USA-San Francisco/LA and London, Notting Hill. Training and Qualifications needed for this job: Maternity qualification essential. Pay: £270-£350 per 24 dependant on experience. Allie Bell T/A Harmony at Home Maternity acting as an Employment Agency. A loving and relaxed family in Wanstead London, are looking for a Mother’s Help four days a week. They are looking for an extra pair of hands to help around the house and with their 11-month-old child, Monday to Thursday, 9am-1pm. The family are very flexible with both hours and days of the week. 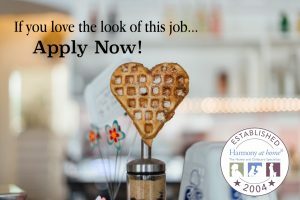 They live in the heart of Wanstead, with local shops and directly opposite a beautiful park, and they are looking for a nanny that is active and happy to assist them when out in the local area. The family are keen on their child playing independently so would like a Nanny that is happy to assist where necessary. The mother loves to cook from fresh and is looking for a Nanny to help with their child whilst mother cooks and assist where necessary. As well as being organised and thinking ahead. Mother will always be at home and wishes to share roles with the right candidate, one that is happy to hop between duties of childcare and tidying. A wonderful family based in Islington are seeking a nanny for a summer start or early September 2019. The family have 2 wonderful children, girl 4 years and boy 4 months. The family are looking for someone who has experience with babies, who is fun, creative, pro- active, and enjoys the outdoors. They should also have a good level of spoken English. The main part of the day will be spent caring for the baby boy as the little girl attends school. The School is a short bus ride away and will involve also taking the baby with the buggy. The family home also has lots of steps so please note when applying that a nanny with lots of energy and who is psychically active would be ideal! Childcare duties will include, school runs, preparing meals for the children, school drop offs and pick- ups, morning and evening routines, taking to after school activities, planning and implementing age appropriate activities, attending play dates and baby groups. The little girl loves baking and helping to cook and both children love a good story book! As the family employ other domestic staff light housekeeping duties are around the children and will include – preparing meals, keeping kitchen tidy, some laundry and other light domestic nursery duties in order to keep things tidy. Demetra Paphitis Limited T/A Harmony at Home North London acting as an Employment Agency. To apply for this job please contact us with your CV ASAP via email to: demi@harmonyathome.co.uk quoting the job reference code: DP42650 thank you. Why not start the New Year working for this lovely family who require a full-time Nanny to look after their Daughter aged 6 months. The position is based in London (SE3) and the are looking for an experienced Nanny to work 5 days per week Monday – Friday 9am – 5.30pm. Salary dependent on experience. The successful applicant will carry out all aspects of childcare and light household duties. Sole care position – parent works from home. The position is temporary due to start date on 18/02/2019 until 30/08/2019. The family live near Blackheath Park and various others, therefore, you will be required to take their daughter out for walks locally. The right applicant will be able to think on their feet, have a natural approach and professional at all times. A wonderful opportunity has arisen to work for this lovely family based in Greenwich. They require a Nanny Housekeeper to start as soon as possible. The role will include all aspects of childcare for their son aged 1 year. You will also be responsible for the house keeping and the specific duties will be agreed in advance. The family would ideally like a Nanny who speaks Italian but this isn’t essential. The successful Nanny will be pro-active, professional with a can-do approach. Days – 3 mornings per week moving to 5 mornings per week after 1/2 months. The family can be flexible with regard to the 3 mornings required. This lovely family based in Sydenham are looking for a Nanny to start at the beginning of February on a permanent basis. The role will involve all aspects of childcare for their daughter aged 11 months who was premature and currently has a feeding tube. However, she is able to eat orally and the Nanny would need to help and encourage feeding via mouth. The successful applicant will be caring, professional with a calm approach. Days required – 3 days Monday, Wednesday and Friday. New Year, New Job! Start 2019 with this lovely family based in London working as a Full-time Nanny to start in February. The role will involve looking after their son aged 5 months. The family require a qualified Nanny and the successful applicant will be professional, approachable and caring. Duties include all aspects of childcare and light household duties. The family enjoy travel and their home is very clean and tidy. Hours/days required are 8am – 7pm 5 days per week Monday – Friday. Salary – £11.00 gross per hour. Full-time Nanny, Wapping – London. December 20, 2018 | Comments Off on Full-time Nanny, Wapping – London. This lovely family based in Wapping – London are looking for a Full-time Nanny to start in April 2019. The role will involve looking after their son who will be one in April 2019. The family require a qualified Nanny to bridge the gap between the end of Mothers maternity leave and the start of nursery. As a result, they are looking for a fixed term contract of 6 – 12 months. This can be agreed in advance. The successful applicant will have energy, enthusiasm and a genuine desire to assist in their sons overall development. The position is largely sole charge, but Grandparents are nearby and often briefly visit in afternoon. The family would consider funding professional development for the right Nanny if required. Duties include all aspects of childcare and the right person would need to be prepared to keep the children’s rooms tidy, help them to put away their laundry and keep the playroom tidy. As well as this, meal preparation for the child. Additional Household help employed in the home. The family are organised and tidy and would ideally be looking for a nanny with a similar character. They also enjoy reading, keeping active, travelling and spending time together as a family. During the day their son likes to be kept entertained and requires interaction. They have a wide variety of play and reading materials. You would be required to take him out for walks during the day. The parents currently use the following languages – English, French and Vietnamese which cover all backgrounds. They do not allow any screen time for their son (TV, phones, tablets) and would require the Nanny to respect this. The family home is based in Wapping near St Katherine’s Docks, which despite its relatively central location is a quiet family-based area. There are several community-based child activities nearby which the son attends, a good park (Wapping gardens) and the potential for nice walks along the river or the canals away from polluted roads. Hours/days required are 8am – 6pm 5 days per week Monday – Friday. Salary – £13.50 gross per hour. This is a great opportunity for a nanny looking for a sole charge role. Lovely fun family looking for a nanny to take care of their two children after school, 2 girls aged 7 and 10. This will be a sole care position. They are seeking an active nanny who is, kind, energetic and dynamic and great organisational skills. The role is for roughly 6 months as the family are moving out of London. The role is based in Tufnell Park near many local amenities and transport links. Duties will involve – picking the children up from school. Taking them to after school activities, planning age appropriate activities and play dates, assisting with homework and light household duties around the children as they employ other household staff. Some afternoons will be busy with after school activities. As the children are at school 9-3.30 the hours during the day will be focused on helping the family organise the house, shopping, preparing meals (essential), making sure the home is organised and happy to offer suggestions and PA duties. To apply for this job please contact us with your CV ASAP via email to: demi@harmonyathome.co.uk quoting the job reference code: DP022 thank you.